MYSTIC, Conn. — Eleven acres of emerald jut into Fishers Island Sound, where sunlight dances like so many well-cut diamonds on gray, wind-whipped water, and the causeway that leads to this place — Enders Island — is just a football field long. But for the young men who cross that tiny one-lane bridge, for the teens and young adults whose lives have been wrecked by drugs and alcohol, who have left behind a trail of betrayal and defeat, of hopelessness and paralyzing fear, it is nothing less than the passage of a lifetime. And when they get to the other side, there’s a priest from Quincy, Mass. — a genial guy whose spiritual home as a kid was a triple-decker in South Boston — waiting for them. He has the simplest of questions. It’s a life-changing one. “Have you had enough?” the Rev. Tom Hoar asks. It’s a question he had to confront a long time ago. Now it’s a question that he helps others answer — step by step, day by day. Hope. 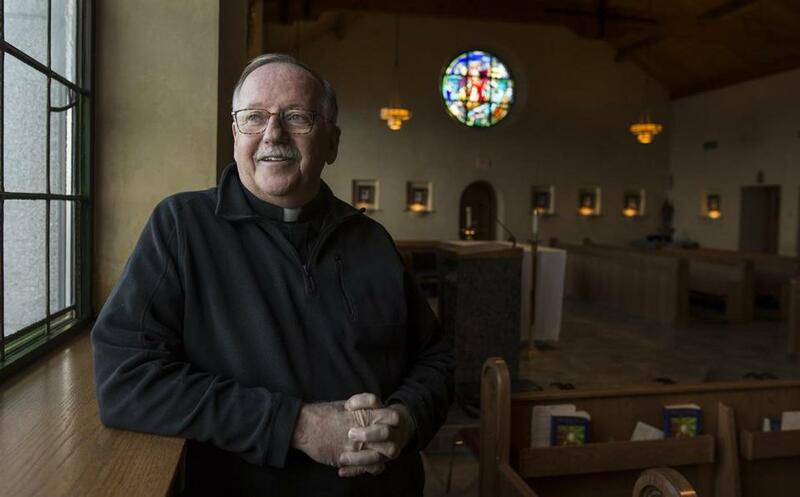 It’s been Tom Hoar’s stock-in-trade — the central part of his priestly life — for nearly 40 years now. That carnage is everywhere you look. The opioid epidemic rages on. The insidiousness of alcohol addiction destroys lives, careers, marriages, families, and futures. Tom Hoar, president of St. Edmund’s Retreat, is devoting his life to charting a course for those who have lost their way. He knows. He was there once. Hoar, 66, was the fourth of five children, whose mother went to work after his father, an MBTA mechanic for 42 years, developed cancer of the larynx. They lived in the close-knit Germantown section of Quincy, a peninsula of blue-collar veterans who had returned home from the war to contribute to the demographic colossus that became known as the baby boom. After Mass at St. Boniface on Christmas, Thanksgiving, and Easter, the extended family would gather at his grandparents’ home, that triple-decker at the intersection of L Street and Columbia Road in South Boston. He didn’t listen. He went to Saint Michael’s, abandoning his pursuit of a medical degree, and ultimately collected enough academic degrees to put most people’s walls of fame to shame. Two doctorates. Multiple master’s degrees. On May 13, 1978, he was ordained into the priesthood. And he developed a taste for alcohol. Good wine. Top-shelf whiskey. Fine cognac. In early October 1989, he was leading a new campus ministry at his alma mater in Vermont. He was alone, drinking in his room when a fire broke out about a mile away. He was the fire department chaplain, so he answered the alarm. 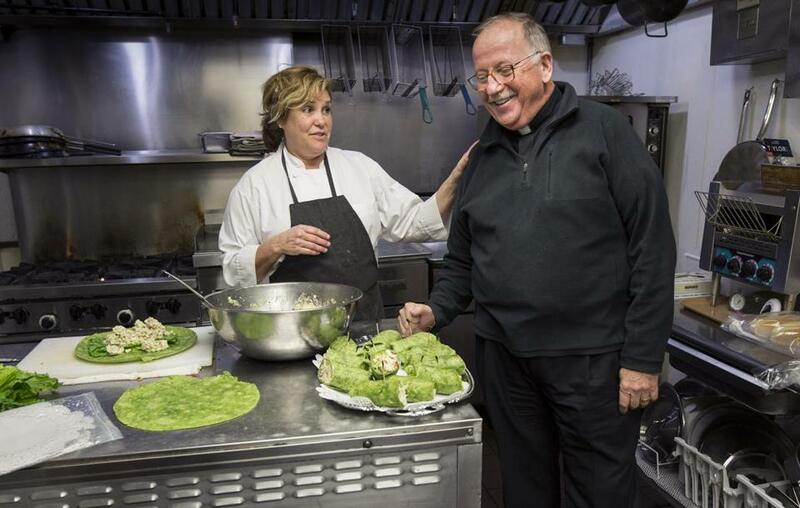 Hoar spoke with chef Rosemary Brodeur at the St. Edmunds Retreat on Enders Island. Those who arrive here at Enders Island to hear that story typically stay for three to 12 months of post-treatment recovery. They develop personal and social skills. They sketch educational goals. These college-age men receive counseling, and more than 70 percent — a remarkable figure — are leading productive lives in sobriety. Simply put: Here, they re-start their lives free from substance abuse’s shackles. And very few can afford the program’s $10,000-a-month price tag. But that’s OK. Somehow they make it work. His board of trustees have told him that hope is not a business plan. Just before he went to college, Tom Hoar was the recipient of generosity that perhaps propels his blend of spiritual giving today. His godfather, a senior MBTA executive, helped his family out when Hoar’s father got sick and helped pay for his college tuition. And so when kids with addiction problems started traveling over that causeway, Hoar invited one to stay. Then two. Then three. And now up to a dozen at any one time. They are men today who testify that Hoar’s obedience to his godfather’s wishes has saved their lives. One of them is Matt Gregoire, a 26-year-old who grew up in Jamestown, R.I., and nearly lost his life to pills and alcohol. When he was 22 and most of his friends were graduating from college, he was sitting on a bench downtown, sipping on a 40-ounce bottle of alcohol. So was he. Until he found his way to Enders Island. And to Tom Hoar. Gregoire’s last drink was June 27, 2013. He got married in January. Next month, he will receive his nursing degree from Texas Tech University. “When we got toward the Christmas season, I was going to candlelight Mass and I started to see and I realized there’s a place for me in this world aside from drinking a 40-ounce on a bench. It made me so honored to have someone like Father Hoar believe in me. A miracle. Like the small, life-changing ones that happen every day on this small island that sits next to a spectacular sea. 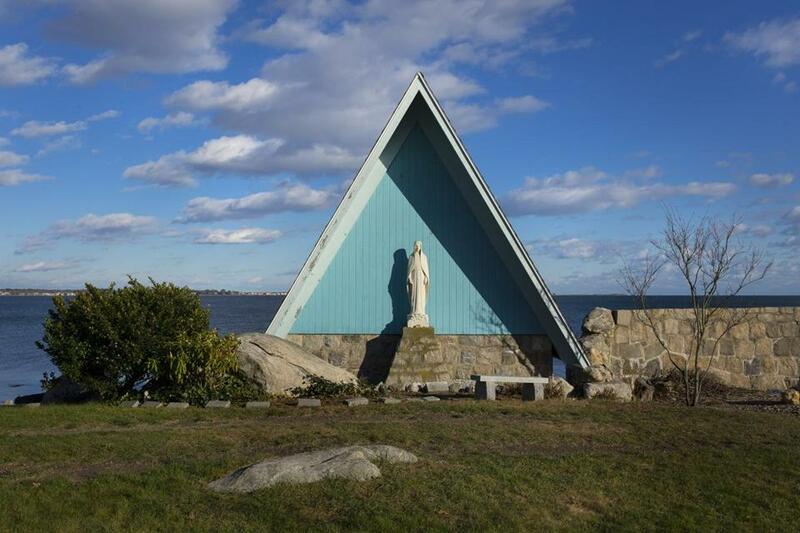 The Seaside Chapel offers breathtaking views out onto Fishers Island Sound.